Basic concepts and full user documentation is available at this link. INFN is providing a Onedata experimental storage space for West-Life users. The storage consists of 14.6 TB. West-Life SSO identity provider (represented by the orange WL button in the picture below) can be used for automatically obtaining an account on the Onedata system. 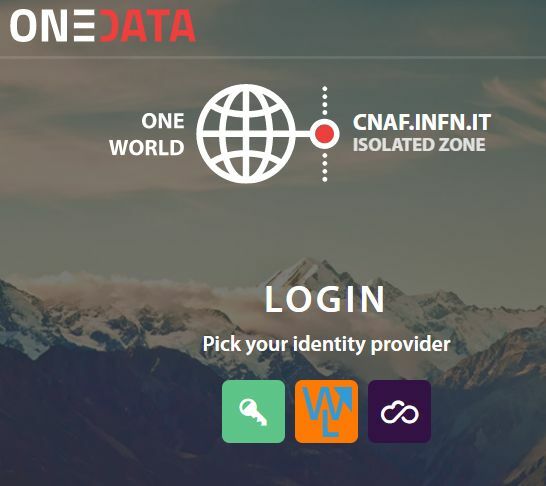 A tutorial on how to use Onedata is available here. Once obtained the account in Onedata, create your space and get support for it sending the generated token (see slide 7 of the tutorial) to the West-Life team of INFN-Padova. It is possible to use Onedata's REST API's as well as oneclient command line tool for mounting virtual Onedata filesystem on the local machine. where "token" can be retrieved from the Onedata dashboard under the ACCESS TOKENS menu, and the space is supported by INFN-Padova Oneprovider. curl -k -H "X-Auth-Token: $ACCESS_TOKEN" -T "/path/filename" "$ONEPROVIDER_HOST/cdmi/space-name/subdir/"
curl -k -H "X-Auth-Token: $ACCESS_TOKEN" -o "/path/filename" "$ONEPROVIDER_HOST/cdmi/space-name/subdir/filename"
curl -k -H "X-Auth-Token: $ACCESS_TOKEN" -O "$ONEPROVIDER_HOST/cdmi/space-name/subdir/filename"
in the second case the destination path is not specified so the file is copied in the current directory.